A child may have rapid vision changes due to growth spurts. Parents and teachers may not recognize exactly what a child sees and the child may not be able to communicate vision problems. Academic and athletic abilities may be compromised by sub-standard vision. A child does not have the means to know what correct eyesight is and may learn to compensate for his/her difficulties causing long-term vision problems. For early detection of ocular diseases such as glaucoma, cataracts and macular degeneration. Changes in vision without a change in prescription can lead to eye fatigue, headaches and eyestrain. During the ages of 40 to 55 years, eyes experience more prescription changes than ever, specifically your near vision. 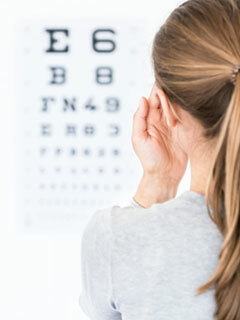 Diabetes is the leading cause of blindness in the U.S. and physical illness may lead to vision loss. During a comprehensive eye exam with refraction, we measure your visual acuity; determine your eye-glass prescription near and at a distance; evaluate your eye muscle coordination; assess the front of the eye with a microscope; perform a glaucoma test; and dilate your eyes to properly evaluate the retina. However, we have invested in new technology so that you may not need to have your eyes dilated! Annual eye exams are vital to maintaining your vision and overall health. The Carlson-Tillisch Eye Clinic offers the optomap Retinal Exam as an important part of our eye exams. The optomap Retinal Exam produces an image that is as unique as your fingerprints and provides your eye doctor with a wide view to look at the health of your retina. The retina is the part of your eye that captures the image of what you are looking at, similar to film in a camera. A permanent record for your file, which allows your eye doctor to view your images each year to look for changes. Please schedule your optomap Retinal Exam with the Carlson-Tillisch Eye Clinic today! Call us at 507-345-5087 to schedule a consultation.